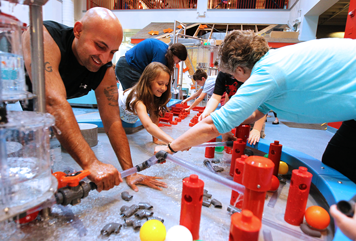 The Ann Arbor Hands-On Museum is a destination for all ages. We offer a range of family-friendly experiences that inspire learning for young people as well as those who are young at heart. Regardless of your age, the Museum is sure to delight with our broad range of exhibits, activities, and programming. Click here to take a virtual tour of our exhibits and then check out our event calendar for details on extra activities and programming. Our exhibits are designed to appeal to all ages, including adults. We also host workshops and adult-only nights. Be sure to sign up for our newsletter for more details! Explore Your World is one of our most popular exhibits. Check out the video below!